Big thanks to my dear friend Christy who gave me the idea in the first place! Hope you can grow nasturtiums in your new home state of South Dakota, Christy! Call with Bob Greene, Oprah’s Personal Trainer! Last month I was invited to participate in a conference call with BOB GREENE…yes, THAT Bob Greene, Oprah’s personal trainer and health guru. There were less than 10 bloggers on the call (Bob’s first blogger conference call, in fact), and we each got to ask him two questions directly. He was super nice and shared some great information, so thought I would finally sit down and share it with YOU! Here are a few of Bob’s health pearls of wisdom! I’ll start with my two questions for Bob. 1) Are vitamin supplements and vitamin-fortified foods worth it? Do our bodies actually absorb them and should we be taking/eating them? Bob said that yes, supplements are a good insurance policy. He talked about how even though vitamins directly from foods are the best, so much of our food is picked early, so its nutritional content is not as high as it should be. A vitamin supplement is a good way to fill in the gaps and your body will absorb some of the nutrients. He recommends taking a multi-vitamin and a calcium supplement each day. He also thinks the vitamin-fortified foods are great and help with absorption. When asked what one big habit should someone change to get healthy…he said there is none. It’s all about balance, small steps, gradual change. The most successful people are the ones who take small steps every day. When you try to change too much at once, you’re setting yourself up for failure. The key is BALANCE. Beans are a super food…eat them at least 2 times per week. Yoga – serves as an excellent strength training exercise. Again, he mentioned the importance of strength training and that the more body weight placed on a joint the better…strength training needs to challenge you in order to see change. Regular pasta is different than white bread…as in healthier. It’s not the same refined white flour. That said…the whole grain pasta is even better for you than regular pasta! Is exercising for 30 minutes twice in a day the same as working out for 1 hour at one time? Splitting your workout is okay to do. There are benefits when doing a long workout…but there are also benefits to getting two different boosts to your metabolism. Either way, you’re good…just exercise! Bob loves BOB jogging strollers…which is funny since it’s his name. And might I add, I also love BOB jogging strollers…one of the best investments we’ve made. There you have it, the highlights from my hour with Bob! Oh! 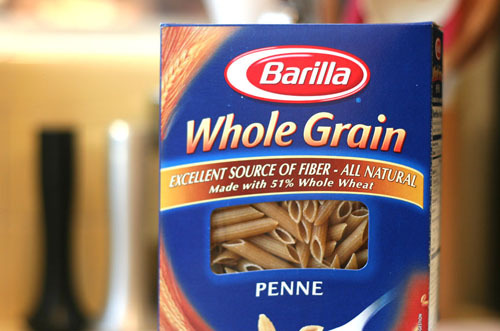 And you may be wondering why there is a box of Barilla pictured…Bob is working with Barilla to promote their new Whole Grain pasta line (hence the conference call). Visit TryBarillaWholeGrain.com for more information. I bought my first box of their whole grain pasta and, as Bob promised, it was good! The texture was a bit nicer than other whole grain pastas that I’ve had and I definitely liked this penne better than other whole grain pennes I’ve tried. My way-gourmet friend Adrianne lived in Italy for a few years and says Barilla is the only dried pasta in America that she likes…if it has Adrianne’s seal of approval, you know it’s going to be good! Thanks to Bob and Barilla! I have to share this tip because I love it. It has absolutely nothing to do with food or cooking, so it doesn’t really classify as a Kitchen Tip…but I’m sharing it anyway! 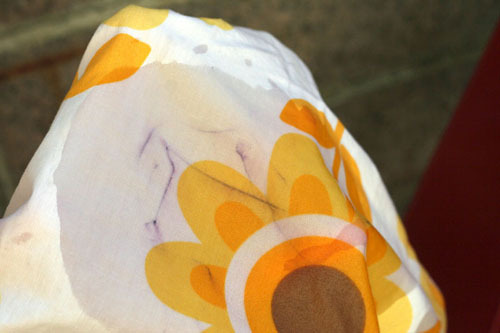 Have you ever gotten pen on your clothes? Yeah, me too. A friend of mine shared the best tip with me years ago that has worked every time since…HAIRSPRAY. Before you wash the garment, soak the pen stain in hairspray for a while (sometimes I repeat this step). I swear it works. It’s like MAGIC. I took this picture right after I sprayed hairspray onto the pen marks…yeah, this is Anna’s brand new, adorable outfit that she attacked with a pen. You can see how the ink started to fade out immediately. I will tell you, the trick did not work once…but the ink was from a bright red, non-ballpoint pen, so I think the ink is different. Too bad, because it was another cute outfit of Anna’s destroyed by none other than Anna herself. Kids! I hate brownie mixes. Even the double chocolate Ghirardelli mix that everyone swears by doesn’t cut it for me. So, when I tell you I LOVE a brownie mix, you better believe it’s a good one. 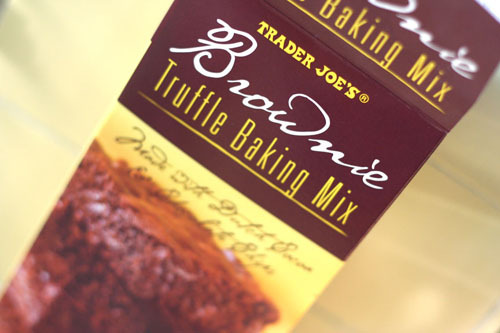 The Trader Joe’s Brownie Truffle Baking Mix is to die for. This is what the box looks like so that you can recognize it and buy it as soon as you see it. Okey dokey, this week’s menu. Oh my, I have a lot of duplicates from last week. I made leftovers really stretch last week, which was nice for me and my lazy ways. – Pot roast, potatoes, veggie, rolls…the works! Time for all of your menus! Please share! Pretty please! Pretty pretty pretty please…with a cherry on top? The first episode features this cute recipe: Cheez-It Game Day Guacamole. I don’t like to encourage Nate’s sports habit, but I might just have to this idea is so cute…guacamole for the football field with piped sour cream for the yard lines and end zone. I love it! Maybe I’ll actually put a little effort into our Super Bowl party this year…maybe. The Gratitude Challenge is officially over. It came at an interesting time for me…it was the quietest three weeks of our year…no school, no traveling, no classes or sports…just three weeks of me and the girls at home getting our chores done. As a result, a good portion of my gratitude ended up being directed towards my children, and that was a good thing for me (if boring for all of you!). It’s always beneficial to stop and really think about the people I love, especially these little ones who rely on Nate and I for everything. Parenting is a daunting task. Sometimes the gratitude gets lost in the hustle and bustle. For those of you who have been following along, here’s a quick break down of the weeks. I didn’t outline any of the ‘assignments’ from this week on the blog. The tasks included things like standing in front of the mirror for 5 minutes and focusing on five things you love about yourself, performing random acts of kindness throughout the day (be grateful for the power you have to make someone’s day), writing a thank you note to yourself and mailing it, and a few more related tasks. So, for my final “I’m grateful for” moment…you may be wondering what the picture is on this post. 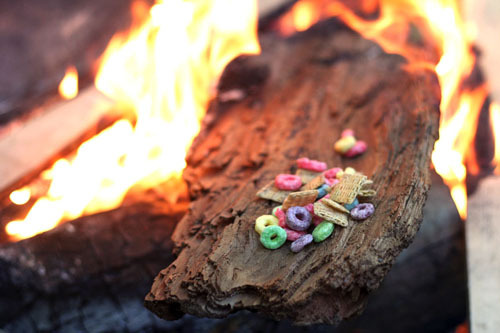 The last morning of our camping trip last weekend, the kids at our campsite started roasting cereal on a log. It was just so cute. And made me once again grateful that I get to watch little minds at work each and every day. 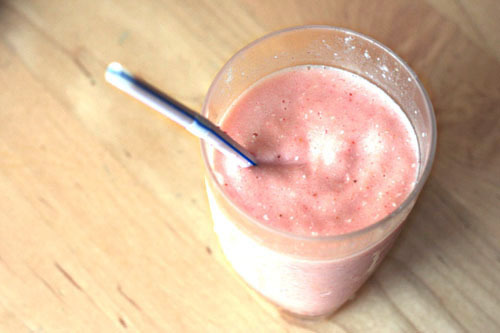 I just made the best smoothie-shake. Awwww yeah. It’s called a smoothie-shake because I couldn’t resist adding a little ice cream to this one. I don’t normally do that, but mmmm was it good. Ingredients listed in order of placement in the blender. I did two rounds of the “smoothie” setting on my Blendtec blender for this one. I needed more fluid, but I loved the final texture, so for me it was worth the extra blending time. I’m going to start sharing more smoothie “recipes” with you…I’ve had several requests, so I’ll try to keep them coming fairly regularly. We’re back from camping at Big Sur. It was WONDERFUL. Relaxing and fun, with no phones or computers…the perfect weekend! I am now buried in laundry, but it was worth it. We went with a group of families that have been going on this camping trip for the last 22 years. They have it down to a science, including the cooking. We ate very well! 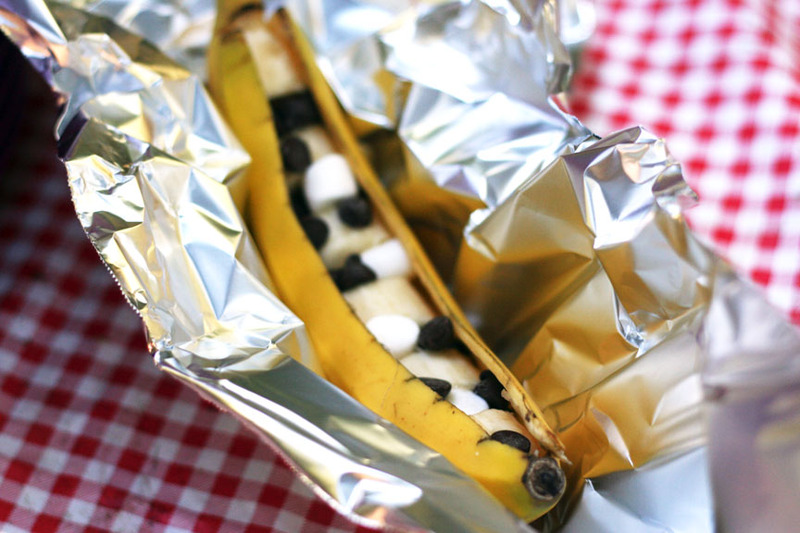 We also learned a new camping “recipe” that was delectably gooey: Banana Boats. 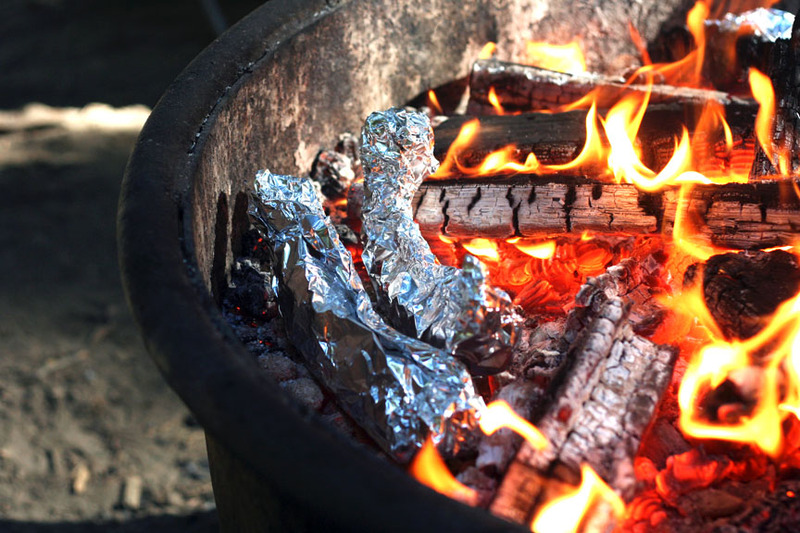 We made them at night along with s’mores…although, we did have them for breakfast one morning as well! 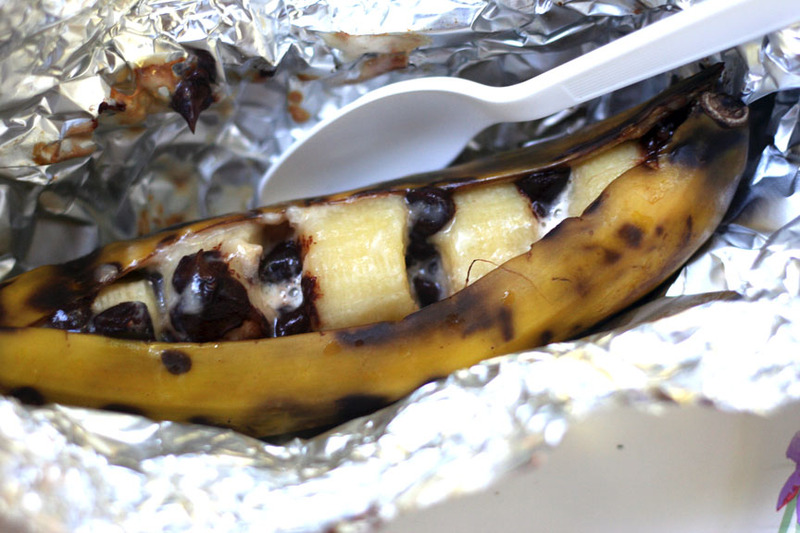 Lay the banana on its “back” and peel just the top open. Cut out slices of banana every half inch or so, leaving every other piece in the peel. Stuff chocolate chips and mini marshmallows between the pieces. Big Sur is nothing if not breathtaking. 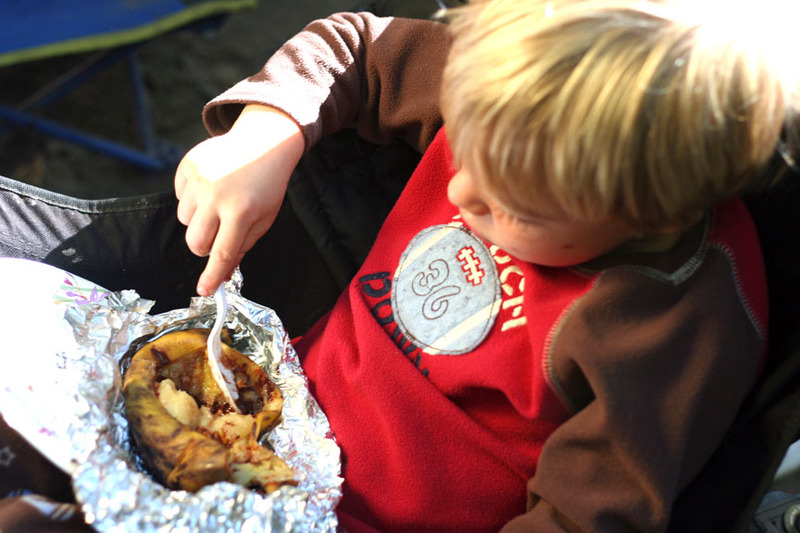 For those of you wondering how or, more importantly, WHY I am posting a menu from our campsite at Big Sur…I am not. I put my menu together before we left this weekend. 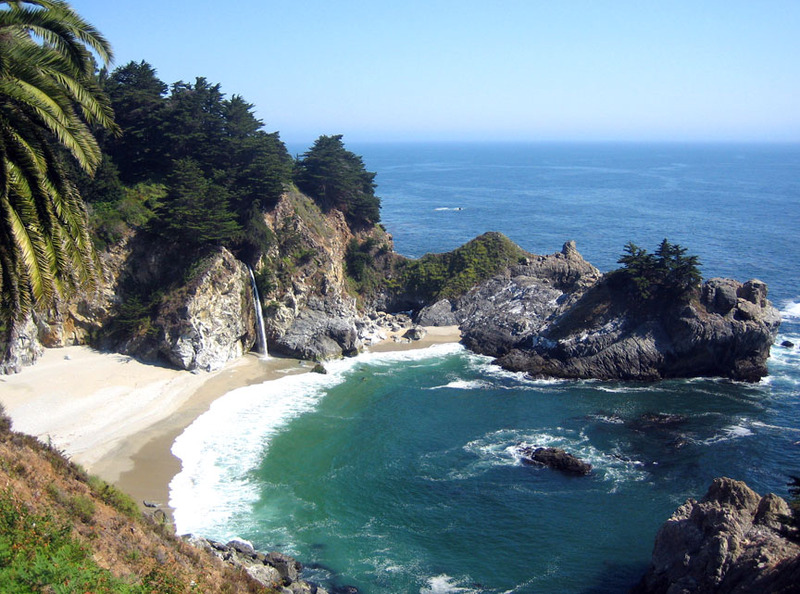 Nate and I visited Big Sur and the surrounding area a few years ago, so I had a picture to share. Now that the mystery is solved, menu time! Please share your menus! Summer is officially over, folks. It’s time to get back in the groove…so plan some menus and share them with us! I’ve said it before, I’ll say it again…ALL MENUS ARE WELCOME! Simple or fancy, they are all inspiring. 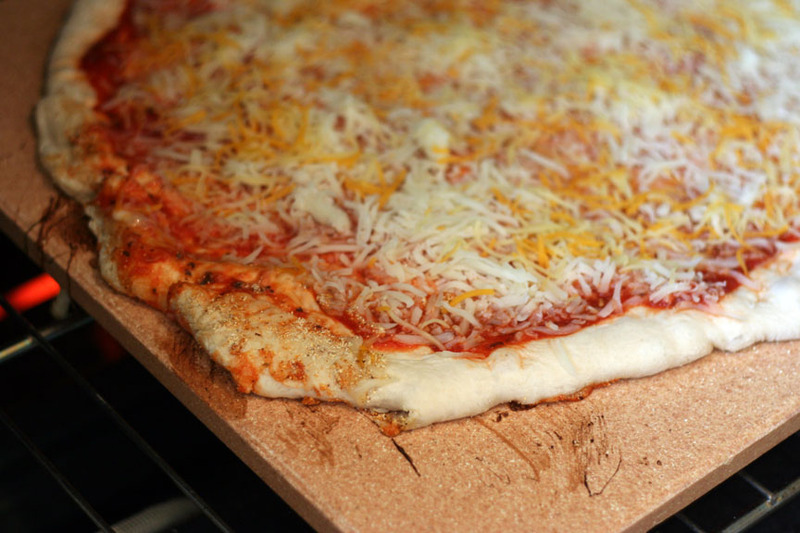 I finally used my new pizza stone this past week. It was fabulous. No, I am not an expert yet. But we’ll get there eventually. 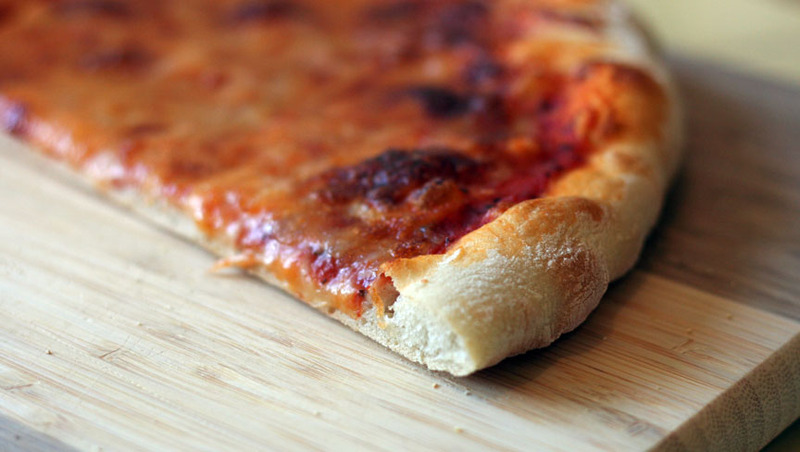 Regardless, the crust was light years better than any pizza I’ve made before. 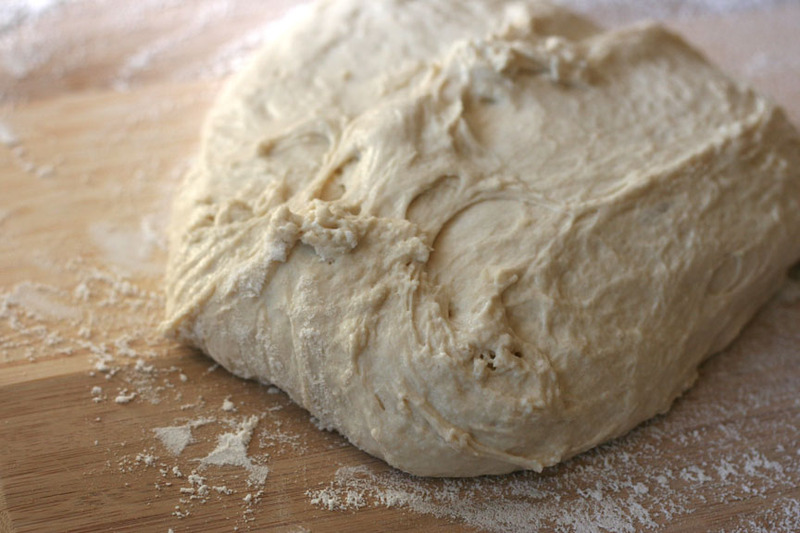 And I cannot wait to bake crusty, delicious bread on the stone. I used Uncle Tony’s Pizza crust recipe, and it was great. Half of the dough made one pizza that fit the pizza peel and stone perfectly. 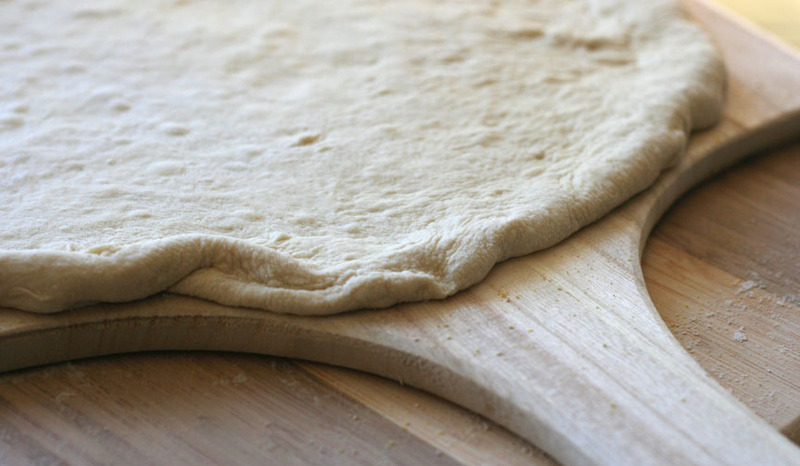 I thought I would be all smart and roll out the other half and freeze it…but the frozen rolled out dough broke as soon as I tried to move it. I think next time I’ll roll it out, then roll it up in waxed paper, then freeze it. It’s worth a try, I think. I’m glad I bought a pizza peel. 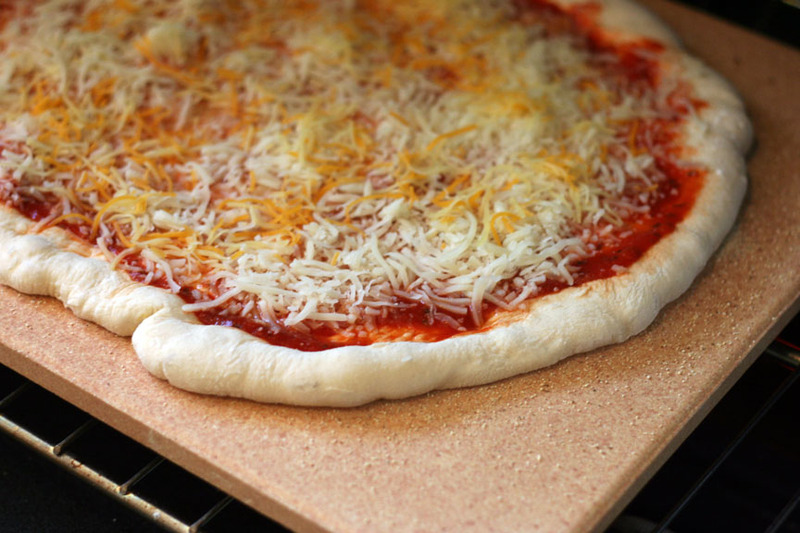 It really is handy getting the pizza on and off the hot stone, with cornmeal sprinkled on both the peel and the stone. See what I mean? Didn’t I do a beautiful job getting the pizza to the stone successfully? Yeah right. Take a look at the other side. Whoops. But only one little spot folded under, not bad for a first-timer. I didn’t get a great shot of the final product, unfortunately. You’ll just have to take my word for it that the crust was GREAT.